The first reaction of many, if not all, Americans visiting Japan is a childlike fascination with toilet bowls. Looking back on my own first major impression, as you can clearly see expressed here on June 29th 2001 at approximately 11PM. This was the first picture I posted in my archive of scanned photographs after my trip to Japan; it was also one of the first pictures I took. Perhaps that was just a natural reaction, considering Japanese toilets are infamous in the US, however I firmly believe the reason for interest in such a taboo receptacle, by American standards anyway, is what I call jokingly call “The Toilet Fixation Theory”. This concept is really quite simple. After spending 11-16 hours on a plane traveling halfway across the world, being cramped next to a stranger in a 2 foot by 2 foot (or less) space and a bathroom that is 3 foot by 3 foot, the first thing anyone wants to do the instant they get through customs or enter a place of living is waltz into a luxurious 4 foot by 4 foot toire, 'bathroom', to relieve themselves. And so, many foreigners' first impression of Japan ends up being, “WOW! THESE TOILETS ARE AMAZINGLY COMPLICATED!”, merely because it is nearly impossible to pay attention to anything of interest from the moment they exit the plane up until that that relieving event. But seriously, as promised in the catchy sub-title above, and as I have made abundantly clear (I hope) in the above paragraph, this will not be a lengthy thesis praising the wonders of the great scientific and mechanical achievements of our time, the exciting products of the TOTO toilet manufacturing company (they have “dedicated” their lives to creating toilet “perfection” which also includes t-shirts and CD-Cases apparently). Instead, this will be a look at the different types of houses that I have encountered in my trips to Japan. As always, I am just one person speaking from my limited experience in Japan. What I write here does not apply to all homes, nor am I implying that homes in Japan follow any predetermined pattern, but the similarities I have noticed in several homes are striking. Having home stayed in many different styles of living spaces, owned by people of varied status, I may certainly offer what knowledge I have of the Japanese home. And don’t worry, there will be plenty of talk about toilets eventually. 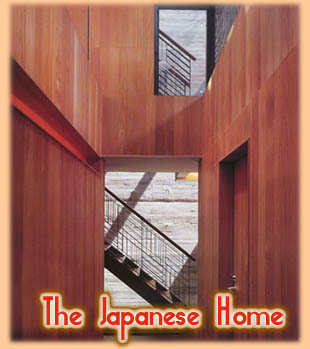 Before we even begin to look at the individual aspects of the Japanese home, it is first important that one have an understanding of the relationship between the Japanese living space and its occupant(s). Contemporary scholars of Japanese sociology and anthropology speak to no end of Japanese group activity. Practiced in schools, offices and among acquaintances, many who have studied Japan would agree that Japan is successful and maybe even “unique” because of its emphasis on group-oriented lifestyle. Most Japanese students participate in club activities at school; even the non-athletic ones belong to English, manga or tea ceremony clubs. In the work place, businesses operate best in Japan when there is a strong link between company and employee. Salary men are often guaranteed lifetime financial support from their employer so long as they work for and with the company for that very same lifetime. Maybe that is closer to bribery than group effort, but nevertheless it gives employees a common bond, and a common shared responsibility. To see a somewhat less refined example of camaraderie amongst workers, one need look no further than to see what occurs after work during nomikai or drinking meets. Co-workers drink together, sometimes in large groups and sometimes in pairs, almost religiously after work. By now you may be wondering how liquored-up middle-aged Japanese males (and females) relate to the Japanese home. In contrast to the aforementioned group activity, living space is one of the places where individuality and protection of one’s personal space is practiced and cherished. Japan is roughly the size of California and approximately 80% of the land is mountainous. With such a restricted living and working space, housing is often cramped, and privacy is a luxury. One will often see ground level street-facing windows of Japanese homes covered by attractive shrubbery. Not only does this create privacy, but it is also a pleasant way of using all available space. In apartments one is less likely to find gardens in the open for obvious reasons, however, it is not unlikely to see flowers or decorations sitting in alcoves. Verandas are also commonly decorated with flora along with drying laundry. Another aspect of the 'typical' Japanese home, with respect to privacy, or lack-thereof, are the paper-thin (sometimes literally) walls. I am referring to the rather unfortunate reality, (at least for AC and central heating-bred foreigners like myself), that Japanese homes are not often constructed with insulation. Without such protection, amorous couples may not be free to let loose with as much freedom as they might like to and family arguments can be easily heard by neighbors. Finally, the Japanese home is closely related to ritual and ceremony. In the homes of individuals who respect Shinto or whose relatives followed Shintoism, there resides a miniaturized rendition of a Shinto shrine called the mitamaya or ‘August Spirit Dwelling’. This structure rests on a raised shelf approximately five or six feet high known as the mitamasan no tan or ‘Shelf of the August Spirits’. Within this shelter are slivers of white wood, each representing a departed family member. Each piece of wood is inscribed with the name of the deceased. Should the family member have been a passionate Buddhist, the object of ancestor worship utilized in this case is contained within the butsudan. The butsudan is a shrine in the form of a decently large shelf (around 3 feet wide and about 5-6 feet tall) for the house that serves the purpose of prayer, and ancestor worship. Within a shelf on the upper level of the butsudan is a mortuary tablet called ihai or ‘Soul Commemoration’ tablet that bears the religious, as opposed to family or given, name of the deceased. Another example of the home’s relation to ritual is found in the celebration of Setsubun, a festival-like occasion which commemorates that passage of winter into spring. This typically occurs on February 3rd or 4th and serves to expel oni, or demons, from the house in a type of a festive nationwide exorcism. In this process, a family may choose to throw soybeans out of the house while saying, “Fuku wa uchi, oni wa soto.”, meaning, “Fortune in, demons out.” Furthermore, roasted soybeans are spread on the floor inside the home and members of the family consume a number of soybeans equivalent to their age; this is a ritual to ensure good health and fortune for the year. In my evaluation here it may appear that I have skipped around a bit too much and you might be wondering where I’m going with this. Before you learn anything about the Japanese home, you must first realize that there is indeed a rather large difference between how Americans and Japanese view their places of living. Now that you realize the importance of privacy as well as the connections between family, religion and the home, you are ready to begin learning more. Wow, did that sound contrived or what? To alleviate any controversy, it would be best to have a frame of reference so that I do not make sweeping generalizations about Japanese homes. After all, how can I ever define a “typical” home? There are so many variations of living spaces that I cannot say, “Japanese homes tend to be beige.” Sure enough you will see purple, blue and pink houses. So when reading this, please make sure you keep the following in mind: This is the culmination of my experiences in Japanese households, and what I have studied. 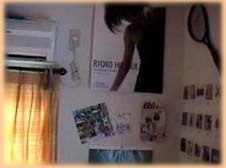 I have not done significant research or made many observations on the lives of Japanese citizens living in apartments. Truthfully I have been inside one standard occupied Japanese apartment and the tenant was, shall we say, "atypical" compared to the twenty-something with a pad in Tokyo. Besides that I have lived in one apartment myself, and since I am not Japanese, how I lived in it does not say much about Japanese society. A tri-level house outside Kyoto city. The home of Mr. Takahara, father of my friend Yu. A bi-level house in Ehime Prefecture just outside the center of Matsuyama city. The Shima family. A tri-level rented condo-like building in Marugame City of Kagawa Prefecture. The Ishikawa family. A “traditional” ranch house owned by a Shinto shrine priest in Kouchi City, Kouchi Prefecture. The Oukubo family. An apartment in Tokushima City, Tokushima Prefecture. A ranch house in Tokushima City, Tokushima Prefecture. The Mima family. A manshyon, or 'upper-class apartment', in Takamatsu City in Kagawa Prefecture. The Shitakubo family. A bi-level house in Ehime Prefecture’s Iyo County. The Maeno family. And a tea-house/museum in Aki City of Kouchi Prefecture. The Takezaki family. Needless to say after such a limited experience I am far from a expert on Japanese homes, but I may certainly offer you my views and observations. Here is what I have found! 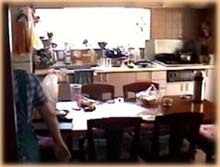 You can only imagine the anticipation pounding in my heart when I arrived at my first Japanese host family’s house in Ehime Prefecture’s Matsuyama City on Monday, July 2nd 2001. I will attempt to recreate the themes that I noticed in that place, those in particular which I found common to many Japanese homes. I must admit that streets may be as narrow as you have heard or read. It does not seem possible to fit more than two small vehicles on a suburb backroad, and yet I am amazed at the coordination and cooperation among drivers in Japan who navigate these miniscule passages. Lining these roads are houses that seem to be packed impossibly tight. However, upon closer inspection, one realizes that a significant amount of space is filled by floral life, making the houses appear seamless. Homes outside a city like Kyoto, or within some rural cities like Tokushima City or Kouchi City, may be situated just as described, or have divisions similar to fences in the form of walls. 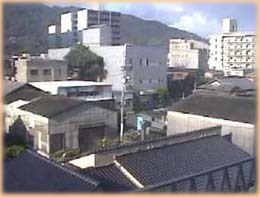 The arrangement of streets may be somewhat perplexing to an American as diagonal and curved streets are numerous, even within a prefectural capital city. In some cases one may turn off a major highway running through a city, and instantly be surrounded by houses with small lawns. Garages are uncommon, I have only stayed with two host families that owned a garage, and they are among the wealthier families I know. An alternative to a garage is a UV-protecting tinted shield that hangs over where a car is parked. It protects the car from weather damage and the extreme heat of the sun during the summer. Sometimes even the shield is not present and the car is parked some distance away from the owner's home in a special garage. For my friend living in the manshyon, his family’s car was parked in an automated car-lift storage device, not unlike those found in metropolitan parking lots across America. I have mentioned the floral life around the house which is actually an important part of many homes that I have encountered for several reasons. 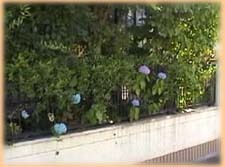 Small plants provide a pleasant and relaxing exterior, taller and wider bushes serve as organic walls between houses or streets granting privacy and plant life in general is closely related to Shinto nature worship. I am certainly not suggesting that placing a flower in your front yard is an act of Shintoism, but the “tradition” of Japanese people’s relation to nature is undeniable. Placing of plants or even creating a garden and pond around the home is something that has been practiced in Japan for hundreds of years. It has simply been modified to fit society today. I was particularly lucky to have stayed with the Shima family in Matsuyama City because Mrs. Shima is an acclaimed ikebana instructor and her husband owns a successful green-tea company. Just for reference, ikebana is a distinct form of floral arrangement created in Japan. Being so intimately affiliated with tea and ikebana, it goes without say that their home and gardens were a visual delight. On our second day of staying with the family, Mrs. Shima took my roommate and I on a tour of the outside of her home, naming each flower, occasionally using English when the name was of Japanese origin. Also, to our surprise, there was a rather large backyard garden which belonged to a florist across the street.. The pine tree in the back of the florist’s house,(seen at right) carefully grown and trimmed with meticulous care, was surrounded by a blooming garden of summer flowers. Mind you this was all inside a small area and completely obscured from outside view by the homes and their respective gardens on all sides. Taking us around to the back of her house, Mrs. Shima explained (even though I didn’t understand it at the time and had to review my videos after I learned more Japanese) that her backyard was designed to be a part of sado, a form of Japanese tea ceremony. This is relatively rare, actually...this is very rare. I mentioned that it is somewhat common to find ponds in some “yards”, but a garden for sado is very uncommon. I find this amusing since I somehow managed to see three living spaces with such a garden. However, I will admit that the other two occasions were when I visited the homes of professional sado instructors, one of whom actually had the garden miniaturized in the front room of her apartment. The sado garden may characterized by a path composed entirely of pebbles, or flat stepping-stones resting in pebbles. 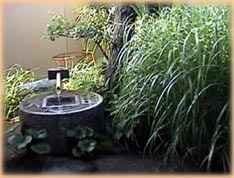 There is a koshikake machiai, a frequently shaded sitting area, and a shishi odoshi with a bamboo ladle for cleansing one's hands in the tsukuboi, a stone basin. The shishi odoshi is a device constructed of bamboo, or other materials as I’ll get to in a moment, that fills with water over a short period of time and *DON* falls with a whack originally designed to scare away deer which the name shishi odoshi literally means to do. I have only seen that particular version of shishi odoshi in tourist spots. The version of shishi odoshi belonging to sado schools, at least so far as I have seen, usually have the bamboo tube emerging from a stone in a stationary position which pours water into the tsukuboi basin for washing or cleansing hands. This version provides no *DON* sound and merely emits a soft dribbling sound of water. As Mrs. Shima put it, “Japanese people like the sound of water.” So although I have given you some history of what the outside of a home or facility designated for proper sado practice resembles, do not expect to see it in the “typical” home unless you go looking for it. Even though Matsuyama City is a prefectural capital, it is rural compared to Tokyo. It was no surprise that I noted many homes still bearing what we might call “traditional” roof tiling. 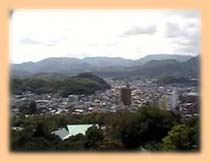 It is also coincidental that Kikuma, a town near Matsuyama City, is famous for producing a specific type of tile. However, that simply does not account for the widespread use of tiling I saw all around the country. Tiles or kawara were originally reserved for temples, shrines and buildings of the elite, however, over time it became apparent that using these clay or stone tiles for common buildings could greatly reduce fire damage. This tiling often gives homes that “traditional Japanese” look that many Americans are used to seeing on TV and in film. Some less decadent homes employ a style that looks more modern or cubicle, while other houses are not only tiled, but also have statues of animals like fish or eagles on their roofs. As far as front-yards, I have yet to see any home that has a yard big enough to sprint across for more than a few seconds. I am certain there are front yards and homes with plenty of land in Japan but I have never seen one. To put it in perspective, my good friend Yu’s father is an architectural engineer; several buildings of his are in Osaka Prefecture. Yu studies in the United States and we actually went to the same college for a while and thus became good friends. Yu’s father owns the largest Japanese house I have ever stayed in, yet he has no lawn. I should be fair and mention that Yu lives just outside Kyoto City, and yet my host family from Tokushima City, live within the city itself and they have one of the largest front lawns in Japan that I have seen at approximately 20 feet long and 8 feet wide. Just for reference, the largest free space, in this case a backyard, or lawn that I have seen in Japan belonged to my host family in Kouchi Prefecture, the Oukubo family. 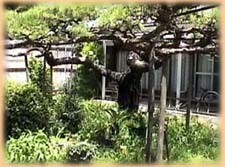 They have a large space behind their home that is dotted with Mountain Peach trees and bamboo. The "yard" space is so large mainly because they live next to a forest at the foot of a mountain. The most “Western-style” backyard I have seen belongs to the Shitakubo family, the same fellow I mentioned earlier who lives in a manshyon. With a grill, grassy lawn, picnic bench and picket fence, it looks like a slice of Americana. But that still does not mean it was not relatively small. These families I speak of are not without large lawns because they are not wealthy. The purpose of this little diversion is to show you that although homes are more “cramped” (at least by our standards) in Japan than in the United States, one may not pass judgment on a family or individual’s wealth based on how much property they own. Most of the homes I stayed in, excluding the imported cars in the driveway, from the outside appeared quite humble. The Shima family’s house, although two stories, if spread out flat is roughly the same size as my own home and remember, Mr. Shima owns a chain of green tea stores. (Not to put down the work that my parents do or anything!) One last note, there are plenty of homes that are surrounded by wide-open space, but that space is often used for producing rice or other crops. In the history of big hairy people coming to Japan, (technically starting with the Ainu), the first American general consul and thereby official ambassador, (Perry being "unofficial" ambassador so to speak), Townsend Harris, was perhaps the first to show Japanese aristocrats that Americans enter a home quite differently. The story goes that Townsend shocked his audience when he traipsed into Edo Castle, also known as Chiyoda Castle, with his shoes on to meet with Shogun Nariakira Tokugawa in December 1856. Taking off shoes inside the home is practiced by almost all of the Japanese population. This is performed in a genkan, a typically square or rectangular lowered section of floor. In this specially designated space for entering from front doors, one may remove their shoes and place them in a gentabako, a shelf specifically designed for holding the occupant’s shoes while inside the home. If there is no gentabako, one simply turns around to face the door, and removes their shoes, toes pointing towards the door and heel against the edge of the genkan opposite the door. It is common courtesy to put them to one side so that anyone entering the home does not trip over your shoes. Before you leave, a member of the home usually aligns your shoes in the center so that you may step directly into them. This whole procedure does not work as smoothly with sneakers as it did when Japanese citizens wore zoori and geta that slipped on easily like sandals, but the concept of cleanliness is retained. This method was developed not to make it harder to enter your house, rather it was to preserve the clean condition of a home. If one walks around his or her house with shoes on, just imagine every place they have visited in a day at work or school: toilets, dirt paths, office floors, sidewalks and so on. No part of their body touched that junk, but the bottom of his or her shoes did, and now the toilet they visited is being tracked onto the floor inside their home. Yummy. Another possible reason is that tight sneakers do not allow your feet to “breath” properly. I must admit, for me at least, it feels much nicer walking around without pieces of plastic or rubber clonking around. Now consider why this would have been an issue for Japan several hundred years ago. The zoori allowed for plenty of air to get to a sock-covered foot, and sidewalks weren’t covered in spit and gum. In the Kanto and Kansai regions of Japan where majority of the population lived years ago, (and still do today) the weather can often be moist and rainy, especially during the rainy season, (who’d have thought right?). Since pavement is something relatively new, I cannot imagine the bottom of those zoori or geta looked very clean after a long rainy trek through the mud. Hence, one changed into clean slippers that were worn around the house. The genkan may be large or small depending on the size of the house or wealth of the occupants. The Shima family’s genkan is very large and lined with flat stones. The step up from this large genkan is also a considerable height. I have noticed a trend that the larger the genkan, the larger the step up. In my apartment in Tokushima City, the genkan was just poured concrete about 2 feet wide and 2.5 feet long. The “step” up was nothing more than a bump that could barely be tripped over. Some genkan will have coat closets on one side. 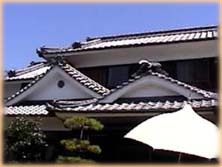 Of particular interest is that although there may be other entrances to the home, sliding doors or what have you, I have not noticed a home with multiple genkan. However, there may be an additional entrance known as the kateguchi that are smaller and less “grand” than the main genkan. It serves as an entrance to the kitchen from outside. One alternative to a genkan is a large overheard covered, and tunnel-like, entranceway to a home where one leaves their shoes on a wooden slat board raised above the ground. This is similar to what you might see in a Japanese school or when visiting Shinto shrines and Buddhist temples. I have only visited one home with this and coincidentally it was a Shinto shrine owner’s home, the Oukubo family I mentioned earlier. The entrance in Mr. Oukubo's home is tunnel-like with a concrete walkway straight through to their large backyard. The sliding entrance to the kitchen was raised on the left side of the tunnel and the laundry and washroom lay opposite it. There is a “front” entrance to the home, but family members did not use it nor did it have a genkan. Okay, so what say we get the guts of the home, eh? I’ve been going on for seven pages in Word and we’re barely past the front door! In six of the above nine dwellings I listed, the genkan fed directly into a hallway that led to other rooms of the home, as well as stairs in the case of a bi or tri-level house. Of the three exceptions, one was my host family’s house in Tokushima City; they had a foyer that centrally connected the major rooms of the house. The next exception was the Oukubo family's home where tatami rooms were connected throughout the house by shoji, thin paper-covered doors with latticed wood that slide back and forth on a track rather than open on a hinge. A wood-floor L-shaped hallway that led to yet another large tatami room and their son’s room, which is where I slept as their son was away at college, was in the back of the house. And finally, the tea shop/museum in Aki City was also a series of tatami rooms connected by shoji and fusuma, doors covered in thick paper often decorated with art. The hallways are not unlike what one would find in the United States. Of course decorative ikebana or distinctly "Japanese" decorations may be present, however, mirrors and porcelain trinkets on shelf-tops are quite common. I have not noted any pattern with regard to room order. In other words, if one walks past say the bedrooms, then a bathroom, a family room and finally kitchen. I have seen all sorts of variations. Dark-stained wood flooring seems to be the most popular and widely used floor for hallways. Only twice have I encountered homes with carpeting for the hall. Even then, the bedrooms had dark-stained wooden floors. In my friend Shinichi’s manshyon, the wood was stained light, as was the case when wood flooring was present in Mr. Oukubo the Shinto Priest’s home. I mentioned above that the outside of many homes, even those belonging to affluent families, appear relatively humble. The family room is where one may start to note the status of the occupant. In Marugame, my host father is an orthopedic surgeon who lives and works in a three-story building. The first level of the building is his office, the second level is where his wife’s mother lives and the third level is where he, his wife, son and daughter live. Their family room is some sort of interior decorator’s dream come true. His wife, Mrs. Ishikawa, is a skilled craftswoman who fashions glass baubles, and glass-ware for fun as well as pottery of all kinds. These works decorate the room along with their player piano and flat wide-screen television. That's me on TV by the way. In Matsuyama City, back to the Shima family, their family room contains a normal piano with bookshelves and a 22-inch television. Aside from what I am about to mention nothing made the room appear any different from a common family room in the United States. Even the plethora of videogames and video game systems around the television belonging to their son and daughter, could be observed in America these days. 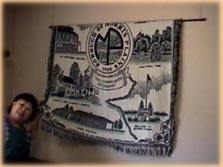 It was the decorative blanket on the wall depicting scenes of Morris County, New Jersey, a county not 40 minutes from my home, which was the strangest piece of decor. When I first stayed with them, the Shima family had hosted seven other exchange students before my roommate Mike and I. Apparently one of the students had given them that blanket and they hung the enormous stitching from their family room wall. The blanket is covered with Victorian buildings that are all preserved by Morris County today. This is not anything that a high-class family in the United States would adorn their walls with, so why have the Shima’s accepted this piece of art as a part of their family room? The answer is really quite simple. How often do Americans purchase a replica of a Hokusai or Hiroshige wood-block print or painting and place it on their wall? We think of the colonial homes as American culture, and since we live here, they do not thrill or inspire us. But a scene of Hokusai’s waves crashing with Fuji-san in the background is plenty exotic for us. In the same way, colonial or Victorian or Colonial-style America is fascinating to many Japanese people. The family rooms in Japan are not so different from what we have to offer. They all seem to focus around the television, just as so many over here do. They are not exactly overflowing with electronic gadgetry like some foreigners might imagine, and in some cases, they may look more "Western" than you think. The “exception” to this was Mr. Oukubo's home, whose family room had a tatami mat and lacquer table...with a wide-screen television and picture of his family at Tokyo Disneyland. Just an interesting note, in apartments, one may modify rooms as they so desire, even tatami rooms, by covering them with carpeting. My neighbor in Tokushima City treated me to an impromptu tea ceremony; I found that she had modified her entire apartment so that it seemed like less of a Japanese dwelling and something closer to my own room, (that is if I replaced anything related to Japanese animation with famous pieces of artwork and trinkets from around the globe). Ah yes, the kitchen, a place where culinary delights originate! Japanese women, for the most part, do control the food works of the household. It certainly is not to the degree where they dole out rations but, when in a family setting, women do tend to prepare casual meals and do cleaning by themselves. Do not get me wrong, I have seen men assisting, but the instances where I have taken note of meals created and cleaned entirely by the women of the household are far greater in number. Mrs. Oukubo in particular had a triumvirate of food patrol as my host aunt and grandmother assisted her at all times in the kitchen. They prepared exquisite meals and any motion of mine to assist in clean up was rejected. Now, rather than try to rationalize the presiding force in the kitchen, let me explain some of the differences you may notice in a Japanese kitchen. I have noted that refrigerators tend to be very large and have many interior partitions, including special freezing units at the bottom. The Shima family has four members and their refrigerator is at least 15% larger than our own "American" three-member family fridge (and we love to eat). I never noticed any major differences with regards to the type of food that were stored in the freezer, simply the amount of it. Junk food, aside from flavored ice and ice cream, was in small quantities wherever I went. Abundant quantities of of vegetables and meats were also stored away, however, to my dismay, it does not appear that milk is as popular in Japan as it is in America as a breakfast drink. Perhaps this is just because I love milk, but I often used up my host family’s moo juice (and I even cut down on my consumption!). If you get one thing from this section on the kitchen, please carry this with you. 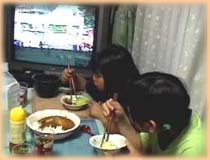 The “modern” Japanese family does not sit on the floor and eat, that is of course unless they are in the family room eating around a coffee table and watching television. Days of sitting on the floor in proper seiza kneeling form at meals began to disappear after Japan began adapting “western” ideas to their society after 1854. Tables and chairs are the norm, as are forks and knives. Japanese citizens are perfectly familiar with forks, knives and spoons. Most restaurants, unless they are noodle shops or “traditional”, will have forks and knives already set on the table. However, hashi, 'chopsticks', may also be found in the kitchens of homes and serve as a major cooking instrument in addition to serving their obvious purpose. Two devices I have noticed that are not likely to be found in an American home were the hot-pot and hibachi grill. The hot-pot is used mainly for the style of meal known as shabu shabu (meaning “bubble bubble”) where one cooks slices of raw meat or vegetables within a central pot shared by the family. The rim of the pot comes with ribbed edges or notches to hold in place the fondue-like fork that one pierces their desired food with and lets sit in the bubbling water until it is cooked. The hibachi is used for a similar purpose, which is cooking raw meat and vegetables. The popular dish sukiyaki is prepared this way, one takes thin strips of raw beef and places them on the hibachi to let it cook. Bean sprouts, onions, and a variety of vegetables are also placed on the grill. Sauce is poured on the grill and one may cook their food in the sauce, which creates an amazing taste! Okay enough of my desire for some good Japanese cooking, time to go to bed! Ah my weakest and strongest point, bedrooms in Japan. (Come on, no jokes now) To be perfectly honest, couples' rooms are a complete mystery to me as I have never even seen the inside of one. However, the guest and children’s rooms are something I am quite familiar with. I will begin by explaining why I do not know much about husband and wife’s bedrooms. Perhaps the main reason I have never even viewed the inside of a host family’s master bedroom is because it is an issue of private space. However, the other reason is that I simply never had a chance to see the room because it existed in an area of the home I never visited, often the upper level. In bi-level homes, such as that owned by the Shima family, I have never even been "allowed" up-stairs where the family’s rooms were. Not so much that I was warned not to go upstairs, rather whenever it came up in conversation, I was always told it was “messy”. In another friend’s house in Iyo City, the upstairs were simply never mentioned by my friend or her family; it existed and did its own thing without bothering me. I feel somewhat left in the dark on this issue, but it is not my place to delve into at this time. The only reason I am even remotely curious as to what exists within these coveted rooms is to see how they compare to a modern "Western" family’s master bedroom in size, design and layout. Be that as it may be, I am quite the connoisseur of childrens' and guest rooms, after all, I had to sleep somewhere. So-called “guest rooms” are often the nicest and best cared for rooms in the house, that is, by Japanese standards; Americans might think they are rather “plain” or “dull”. These tend to be the tatami rooms I mentioned earlier and the more appropriate name for them is washitsu, which simply denotes that the floor of the room is covered with a tatami mat. In a modern home, there may be no washitsu rooms, one of them or even several linked together. It has been my observation that homes with carpeting in a large portion of the home do not often have any tatami mats; they appear to be largely present in homes otherwise entirely furnished with wood-flooring. The exception to this would be the Mima family in Tokushima City. Their foyer is fully carpeted but the bedrooms were all washitsu. 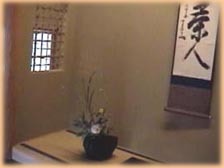 In addition to showcasing the tatami mats, if a washitsu displays certain characteristics, it may be called a zashiki, or ‘harmonious space’. I may have made that sound rather exotic, but most Japanese people would simply describe it as a “Japanese-style room”. A zashiki might have artwork on display in the form of kakejiku with shuuji (Japanese calligraphy on scrolls), poetry, dolls, ikebana, or simply antiques all within an alcove called the tokonoma. This is also a room where one may find the earlier mentioned butsudan or mitamaya. By all “Western” definitions, these rooms would be rather plain, but in Japan it is the best kempt room of the house designed for relaxing and hosting guests. As I mentioned when discussing the outside of the home, the Shima family had a garden designed for sado, and their zashiki was also specially designed for partaking in sado-style tea ceremonies. Two shoji sliding doors obscured a back room where the tea was prepared, and two fusuma sliding doors were at the entrance to the room from the foyer. Here Ms. Shima unveils the ro, a sunken hearth for boiling tea water, that is covered when not in use by a small square of tatami and then floorboard. Although I did not personally sleep in the washitsu at Oukubo san’s house, my roommate did and they were adjoined to one another so I constantly traveled in and out of it. It was perhaps the simplest of the washitsu rooms I had seen with only windows and fusuma which pleasantly covered the oshiire closet in which was stored futon and bedding. Now please do not get the impression that every home has a guest room, washitsu or otherwise, either. If that were the case then I would not have been sleeping in the rooms of children away at college. My good friend Shinichi who lives with his family in the manshyon in Takamatsu City does not have any guest room, nor any washitsu. I spent a night at his house on a sleeping bag on his bedroom floor. I’m not complaining! It was great! That is just an example of the differences that exist. As far as children’s rooms go, only the Mima family’s children seemed to have washitsu bedrooms. In every other home (not apartment) I stayed in, the children’s rooms were like stepping onto US soil. Posters of Britney Spears, the Yankees, Backstreet Boys, and Alan Iverson cover the walls of children & young adult’s sleeping quarters. Futons were out of the question in these spaces. Shinchi actually has a bunk bed, but he never uses it, he sleeps on the black leather coach underneath it. Excluding the carpet, superfluous Japanese animation and Morning Musume merchandise, many bedrooms that I have seen are not altogether too different from mine. I really cannot make any generalizations of youth’s rooms because they are as varied and unique as those you would find in America. Japanese bathrooms are exactly that, bath rooms or furoba. Please do not mistake this for a room where you relieve yourself, toilets are kept exclusively in their own room (more on those later). These special rooms for bathing are frequently located adjacent to a room that contains a sink, mirror, wash machine, etc. The furoba exists as its own enclosed area, the walls and floor lined with water-resistant tiles. A showerhead on a moveable cord can be placed in a holder at a low or high position for cleaning one’s body. The bath next to the shower or wash area is not used for cleansing, instead one cleans their body outside of the tub (which has already been filled with heated water) and a cover over the tub prevents dirty water from splashing into it. One may sit on a shower stool and place the showerhead on a low hanger then proceed to rinse their body, scrub their hair and so on, while seated on the stool. After being completely freshened-up they may enter the tub and soak in it. This may confuse Americans as the entire point of taking a bath has completely been eliminated prior to actually going IN the bath itself. The idea of the bath is not to clean your body, it is simply to relax and soak. The whole family will use the same bathwater, this saves on refilling the tub after each use, and that is why you completely wash and rinse yourself BEFORE taking a dip. 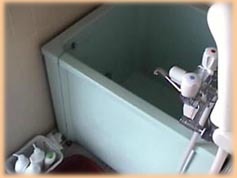 As for my personal experience with furoba, well, in my apartment in Tokushima, the washing area was not wide or long enough to take a large step across, while the tub (seen above) was actually an upright rectangular shape that I had to lift my leg up and over to get into. In contrast, my host family in Marugame City has a furoba one could get lost in. Then there is my friend from Iyo City whose bath is molded to the human body and was essentially a one-person jacuzzi. As for actually going IN the bathes...well...I chickened out...sort of. I was never quite sure if I was the first person to use the bathroom and I am sure my friends and host family were all very clean...but still. More than that though, I personally did not want to get the bath filled with my gaijin germs if indeed I was the first person to clean up that evening, so I avoided them as a matter of courtesy rather than squeamishness. I have not encountered any home without the showerhead/bath combination. It may be safe to say that most homes and apartments have these relaxing accommodations. Some of them may be surprisingly decked out with electronic gadgetry, such as monitors that list water temperature and can automatically fill or empty the bath. Perhaps one day I will venture into a tub and report back! Come on, we've gotta have a little fun! I wasn’t going to leave you hanging without a discussion on toilets. Before entering a bathroom in Japan, even in the most “modern” and “Western” homes, you will remove whatever sandals you may be wearing around the house, if any, and leave them at the door. Inside the room are a special pair of sandals reserved exclusively for toilet use. The toilet sandals do not leave the room! These toilet rooms are generally very small at about the size of a small closet, even in affluent homes. Inside one will find usually just a toilet and a sink of some kind. 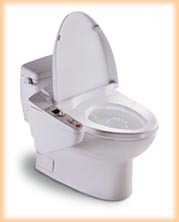 It is not uncommon to see a sink on top of the toilet if it is a simple mechanical flush design (and sometimes on electronic versions). The water that will fill the basin at the top of the toilet after you flush rushes through a spout before entering the basin. You may wash your hands with this water and therefore not only has the need for a sink been eliminated, but this also saves water since what you just washed your hands with will fill the toilet after the next flush. I found this type of toilet present in my apartment in Tokushima, Yu’s home in Kyoto and also in Mr. Oukubo's house. The models owned by my host family in Marugame City, the Ishikawa’s, were what Americans tend to identify with as “modern Japanese toilets”. Among other functions were bidet spray, a drier for your bottom, heated seats and, I kid you not, a remote control for flushing. I really do not need to speak too much about these toilets. Other than their amusing functions, they operate just like their American cousins. If anything, just take a few minutes to savor the experience of having your bum heated while going to the bathroom. I make light of the issue but it actually has a practical application. As I mentioned earlier, since homes in Japan are not insulated like those in America, it would not be a pleasant experience waking up in the middle of the night and placing your posterior on a freezing-cold toilet seat. See, there is a purpose for everything! Public toilets, depending on where you are, may be even more technologically fascinating or horrifying. Traveling on the Shinkansen, 'bullet train', I could not help but chuckle after spending a good 15 seconds searching for a handle or button to flush the restroom toilet with when on the wall next to me I finally noticed a sensor with a sign that read, “To flush, please wave hand over sensor.” I have also been made aware of toilet-paper dispensers that play music when one removes a few sheets from the roll. 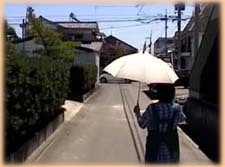 What is most interesting about this particular invention is that is serves a very practical purpose and many men in Japan are not even aware that they exist. This gadget is known as the otohime, literally 'sound princess', and is used for saving toilet water. Women in public restrooms would frequently flush toilets to mask the "unpleasant" or "embarassing" sound of urinating. This device was created and used in public restrooms across Japan so that females could tinkle in peace. Well, since I have covered what you are most likely to encounter, allow me to present something you might not experience. I briefly mentioned that my home stay in Aki City was in a home that was a tea shop and museum. I lied a bit. There was indeed a “museum” in the home, but it was by no means a public one. My host family, the Takezaki’s, took my roommate and I into a back room and showed us a huge vault. They opened the vault and inside was a two-room “museum” or rather ‘private collection’ of calligraphy, coins and paintings. It was a rather surreal experience, the two rooms had no windows and were entirely climate-controlled. What is the major difference between Japanese and American homes? Yard space. That’s it folks. Sure, there are religious symbols inside the house, but it is not uncommon to find a crucifix, a Bible, photographs of the deceased or other religious symbols in any American household. Yes toilets may be different, but not everywhere. As for removing shoes, I see nothing strange about wanting to be clean and keep your house that way. I practice that as do many of my friends in America. However, in my travels through over 10 prefectures, I have not seen one home with a yard equivalent to a rural American family’s yard area, let alone a suburb. As I mentioned at the start of this, even Japanese homes are not exactly small by American standards, it is the lack of space in-between them that makes them appear as such. Once again, Japan is a country that is approximately the size of California and over 80% covered in mountains. In that small space, a people that number approximately half the population of US citizens are living, working and reproducing. It should not be a surprise that their leisure space suffers from that consequence. Looking beyond the major differences in size, as well as what may be considered custom, and you will see that the homes, although occasionally architecturally different, are situated and run much like ours. The real differences are small, no pun intended. If you take anything from this review of Japanese homes, I would ask that it be a sense of objectivity when you see a stereotype of Japanese households in the media or entertainment. That includes toilets too. What have I really taught you about Japanese homes? Not that much to be honest. You now know the basics. As if anyone could ever catch every detail or every exception to every generalization in any observation. I have also tried to avoid a discussion on the meaning of objects or manners within homes mostly because I do not understand them entirely myself. The purpose of this has been to acquaint you with some things you might encounter during a home-stay in Japan or visiting a friend’s house. I do not believe that any conclusions I have drawn can be seen as factual, they are merely my opinion from several experiences that I have been fortunate enough to have had. Please use this guide as a starting point to learning more about Japanese homes and customs! Title image created from scan of Erhard Pfeiffer's photgraph used in Michael Webb's article in Architectural Digest August 2003 entitled "A Japanese Expression". And of course many thanks to all of my host families and friends in Japan who made this possible.